A few weeks ago, Laurinda and I visited the Mercantour National Park, in the French Alps. One of the highlights was a day at Alpha Loup Wolf Park, where wild wolf packs are kept in their natural habitat. 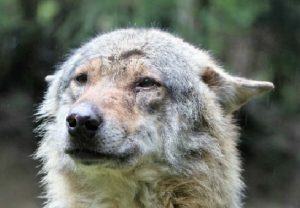 It was opened in 2005 following the natural return of wolves to the region from Italy. Despite being a cool, at times rainy day, we were so captivated by these animals that we remained in the small park for five hours. Until that day, I had no idea how many Hollywood mis-conceptions I had held about wolves. est could not be heard. They seemed to glide between the trees. Yet, there was communication. Each animal knew its place and the pack was highly organised and ordered; the alpha pair establishing a strict pecking order. 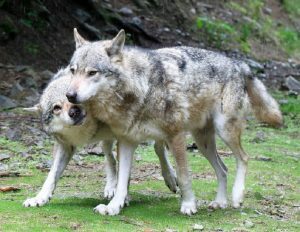 In fact, wolves are intelligent animals. Their distinctively broader skulls housing a brain far larger than their domestic canine cousins. As keepers brought food into this controlled environment it was fascinating to observe the order in which each animal took its share of the meal, and the restraint shown by animals further down the pecking order, who nonetheless maintained a constant vigil. There was no chaotic squabbling, rather silent deference to the order determined by the alpha pair. haviour of wolves made me wonder whether there are misconceptions about the way we interact as brothers and sisters in a church family. One such misconception is that the church is a place where we attend voluntarily, so are free to come and go, and do largely as we please. Yet, in Romans 12, Paul speaks of the church as an orderly and united body (albeit of very different people) under one head Jesus – our Alpha and Omega. Each person has been called to take up a unique and specific role and function, for the good of the wider body. us that though we are many, each of us belongs to all the others, and should offer ourselves and the gifts God has given to us, in his service (vs 6-7). The wolf pack worked smoothly and effectively because each animal knew its place. How much more the body of Christ works effectively when every member knows their God-assigned place. Of course, in the church, there is no ‘pecking order’ but there are different gifts and roles, distributed by the Father according to need and his perfect foreknowledge. What privilege is ours to be given a place, not just in eternity, but in his church body today. Each of us that have responded to his call, without exception! Lord, what is my place in your church? Lord, am I playing my part in the effective functioning of your Church? It can be easier (more comfortable) to offer practical gifts, but what of the spiritual? I am so grateful for what you all bring to PHBC, but I sense we could be so much more effective for him if we all found our God-appointed place.